It's been a while since I've felt the need to share a new hair product with you, as I'm usually using the same old stuff or left unimpressed by latest offerings. 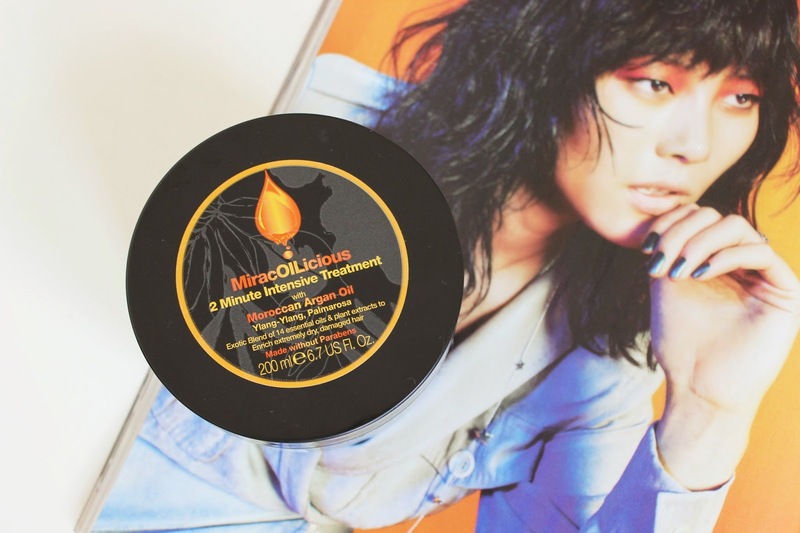 However, I've recently discovered a mask which has worked miracles for my lightened, heat abused locks- meet Mark Hill's MiracOILicious 2 Minute Intensive Treatment. With the dark packaging and midrange price point it's not something I would usually have picked up, but then Corrie mentioned it in one of her favourites videos and the rest was history... Before using this my hair was feeling rather dry and damaged due to a round of blonding followed by dabble in pink hair chalk. But after leaving this thick, love heart scented (a marmitey choice there) concoction of 14 essential oils and plant extracts on for just a few minutes, my hair felt so silky, soft, moisturised and manageable! I've been using it as a conditioner with almost every wash since, as even with frequent use and the main moroccan argan oil ingredient, it doesn't weigh my hair down or create product build up. You might not love the super sweet love hearts scent and I also wouldn't take this too close to the root if you have fine hair, but my locks haven't felt in such good condition in a long time and I think at £7.99 from Boots more people need to bathe their barnet in this hidden gem. This sounds like a such a good mask, I'm always looking for new masks to make my hair feel silky soft! I used to love Mark Hill products. I’m not a massive fan of hair masks, mainly due to the fact I feel like they are just conditioner but in a pot. But this sounds amazing.